LONDON (Reuters) - The potential for British online fashion retailer ASOS is "huge" as the shift to internet shopping accelerates, the company said on Wednesday, sending its shares soaring as it beat profit forecasts and flagged years of double-digit sales growth. ASOS's current plans are for a 4 billion pounds ($5.3 billion) a year business, in terms of revenue, up from 2.4 billion pounds in the year to Aug. 31. "But that’s not the end for us. We will continue to invest and we’re eyeing up a significantly bigger prize than 4 billion pounds," Chief Executive Nick Beighton told reporters. 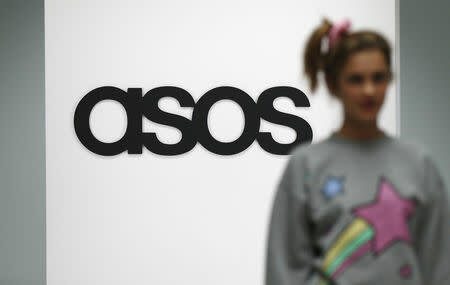 "The opportunity for ASOS remains huge which is why we’re investing to capture it," he said. ASOS, which sells fashion aimed at twentysomethings, invested 242 million pounds in its 2017-18 financial year, mainly on warehouses and IT, and plans to spend 230-250 million a year over the medium term. While ASOS and online peer Boohoo continue to report robust sales growth, Britain's traditional clothing retailers such as Marks & Spencer, Debenhams and House of Fraser are struggling and closing stores. Beighton said online sales currently account for about 24 percent of the UK clothing market and that this is forecast to hit 30 percent within five years. The United States and Europe are following similar patterns. While ASOS' market share in Britain is 7.5 percent, it is still tiny overseas, with shares of 1.6 percent in the rest of Europe and 0.5 percent in the United States. But on Wednesday, the firm hit full-year sales growth forecasts and reported a 28 percent rise in pretax profit. Combined with its confident outlook, that sent its stock as much as 15.4 percent higher. Shares in the 18-year old company were up 590 pence at 5,596 pence at 0850 GMT, giving a market capitalisation of 4.7 billion pounds - just ahead of the 134-year old Marks & Spencer's at 4.6 billion pounds. "We believe that ASOS remains a structural winner, given the shift online by consumers, together with harnessing the global opportunity as the ‘go-to’ platform for online clothing," said Shore Capital analyst Greg Lawless, maintaining a "buy" stance. ASOS made a pretax profit of 102 million pounds in the year to Aug. 31 - just ahead of analysts' average forecast of 101 million pounds, on the back of a 26 percent jump in retail sales and 19 percent rise in active customers. "The underlying business is humming," said Beighton. ASOS forecast sales growth of 20-25 percent for the 2018-19 year and expects to grow at that rate for the medium term. The difficulties at traditional store-based retailers in the face of internet competition has prompted calls in Britain for a relaxation of business rates - a property tax - and for the imposition of an online sales tax to level the playing field. "It strikes me the core problem to solve and where the attention should be is on solving corporation tax leakage and fixing business rates," said Beighton. "We will pay whatever tax the government says we should pay."